I specialise in microsurgical vasectomy reversal (vasovasostomy and vaso-epididymostomy). 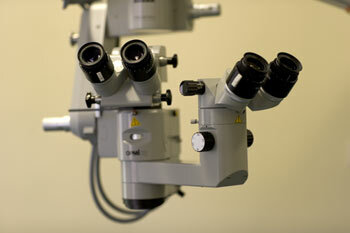 To achieve world class results, regular microsurgery is vital to maintain skills. This is bourne out by my results, which at upto 98% success rate (see below) are in line with the very best in the world. The following is an explanation of the background and alternatives to microsurgical vasectomy reversal. Currently 3-5% of men who undergo vasectomy at some point decide to have the procedure reversed. There are a number of possible techniques available and it can be confusing to decide which is best. In broad terms they are split between surgical reversal or test tube techniques such as ISCI (a type of IVF). To take surgery first, this is further sub-divided into standard vas reversal and a microsurgical technique. The latter is the technique recommended by the European Association of Urology (European association of Urology Guidelines on Male Fertility), the British Urological Association and the American Urological Association. This technique has a number of advantages. The success rate across the board is better, particularly for men who have had vasectomy more than 5 years previously. This is because the back pressure produced by the vasectomy causes damage in the small tubules of the epididymis. Only by using a microscope can these blockages be by-passed. The sutures used in the microscopic technique are 25 microns thick (one quarter of the thickness of a human hair), those in the naked eye procedure are 400 microns thick, in other words 16x larger. These do not allow the delicate placement needed and may well cause obstruction by themselves as the vas heals after surgery. I perform microsurgical vasectomy reversal (vasovasostomy - i.e. vas to vas and vasoepididymostomy - vas to epididymis for those who have epididymal blockages due to long standing vasectomy) using a 6x to 25x operating microscope. I perform the surgery under general anaesthetic as it can be a long procedure and microsurgery can only be performed if the patient is still. I use specialist day case anaesthetists to ensure that the effects of the anaesthetic are minimized (although I advise an overnight stay after surgery). Very few UK surgeons have performed enough microsurgical vasectomies with long enough follow up to produce detailed rates of success. US figures from Belkin et al. J Urol 1991, March;145(3):505-11. It should be noted that these figures are from a multi centre trial (i.e. more than one surgeon). These results should be compared with the IVF success rate of about 28% nationally in the UK (although some centres are higher). A second point to note is that in another large trial, patients who had a first, failed non-microsurgical reversal underwent a microsurgical reversal as a salvage procedure. These patients had an overall success rate of 75% for sperm production and 43% of couples went on to have children. So even a previous failed attempt doesn't preclude success with repeat surgery and I have certainly had success with men in this situation. My personal results for sperm production in men who's vasectomy was less than 18 years ago is 96%. In the subgroup who are suitable to have microsurgical vasovasostomy (vas to vas join) on both sides the results are almost 100%. For the largest group of all patients, which includes men who are having repeat operations where other surgeons reversals have failed, men who have a single testes and the more difficult vas to epipidymal tube join alone the overall results are still more than 90%. I tend to see a larger number of diffucult patients because of the national referral base. These results are as good as any surgeon in the other major world centres. The second method is to use In Vitro Fertility methods (IVF) in this sperm is removed from the testicle or tubes at the side of the testicle using a needle under local anaesthetic. The man's partner will need to take a number of drugs to excite the ovaries into producing a large number of eggs. These are removed from the woman and the man's sperm is injected directly into the egg (ICSI). The success rate of this is approximately 28% per attempt, although this is directly proportional to the women's age dropping to as little as 10% overall chance of success in women over the age of 40 (with multiple cycles). Due to the improvement in the success of microsurgical vasectomy reversal, IVF does not produce a higher pregnancy rate than surgery until 15-20 years after vasectomy. In addition the cost of fixed price vasectomy reversal is currently £2500 - £6000 depending on the technique (microscope or no microscope) and location ($13,000 in the US!) whereas ICSI and sperm retrieval are likely to cost approximately £10,000 -£20,000 for a single child (i.e. 1st cycle £5,000 then 3 cycles with a 25% live birth rate at £2,500 each). A further benefit of surgery is that if successful there are no additional costs if the couple wish to try for further children whereas for ICSI each cycle of placing fertilized eggs into the women has a further cost. If it has been a long time since the vasectomy (but less than 20 years) the best compromise is probably a microsurgical vaso-epididymostomy with sperm storage at the time of the operation (MESA) this can then be frozen to be used at a later date if the procedure is not effective at minimum extra cost. For men who are having a first time vaso-vasostomy, who's vasectomy was less than 18 years ago the success rate is 96%. The results for microsurgical vasovasostomy on both sides (vas to vas join) are almost 100%. How are these achieved?